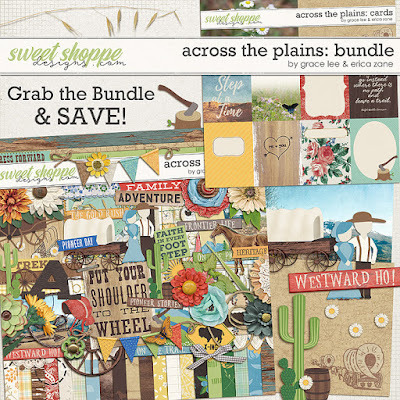 Across the Plains: Bundle with Erica Zane is inspired by the old west. Imagine layouts of family adventures exploring mining or ghost towns, seeing the great national parks, riding in a chuck wagon, horseback riding, or checking out a Wild West show or rodeo. This collection is also great for documenting western themed parties, amusement parks, Pioneer Days, or vintage family photos. Westward Ho!